As we develop some concluding thoughts, it is important to note from the beginning that there are foundational similarities between Kruger and Turretin. As an example, the following quote from Turretin deserves some attention: “[The Church] declares the already existing authority by arguments drawn from the books themselves.” Compare that to Kruger’s insistence that “the canon guides, controls, and determines how it is authenticated.” Both statements reflect an effort to give Scripture foundational authority even in its own construction. The strongest similarities between Kruger and Turretin are rooted in their recognition of a threefold epistemic cause of faith in Scripture. The following chart is an attempt to point out the substantive similarities between Kruger and Turretin in relation to their understanding of the threefold epistemic environment for belief in the Bible’s divinity. It would be very difficult, given these statements from Turretin, to fit him into an evidentialist mold or into a historically determined model for the canon as exemplified by Warfield. Those who disagree with this conclusion might be tempted to refer to places in Turretin’s writings where he points to historical realities to reinforce his arguments, therefore demonstrating that Turretin is not averse to historical methods. They would be mistaken, in assuming that historical arguments are disallowed, given the self-authenticating model. The self-authenticating model admittedly makes historical arguments part of its approach. It is, however, opposed to making historical considerations the sole determiner of what books are canonical and what books are not. 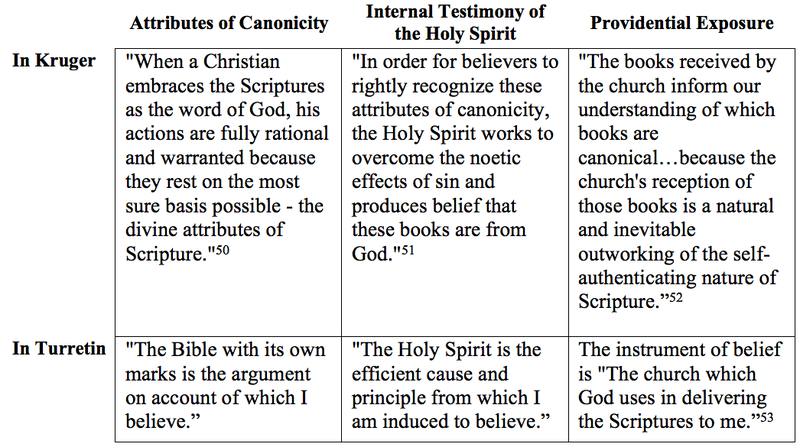 On the other hand, while someone such as Warfield would not in the least denigrate or reject the importance of the Holy Spirit in the formation of the canon and while they would not reject the divine qualities of Scripture, they would be averse to making these two traits foundational criteria for determining what is Scripture and what is not. 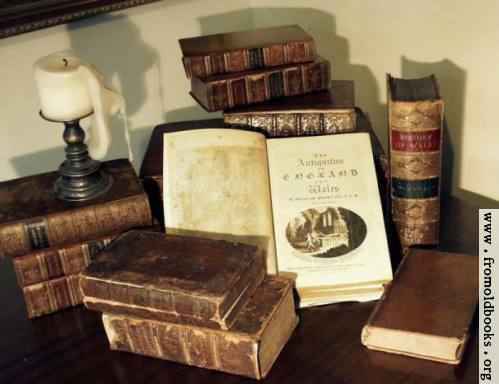 As quoted earlier, “If the historical authenticity of our Canon is to be denied, it must be done at the expense of all our historical sources; at the expense of the falsification of history herself; at the expense of the destruction of the grounds of all historic inquiry.” When the authenticity of the canon is rejected, it is not fundamentally the Scriptures themselves which are being rejected and it is not the Holy Spirit who is being spurned, but it is the historical material that is being rejected. In that sense, the Warfieldian who claims Turretin as an ally in this discussion has an uphill climb. For Warfield, apostolicity is fundamentally a historical search. 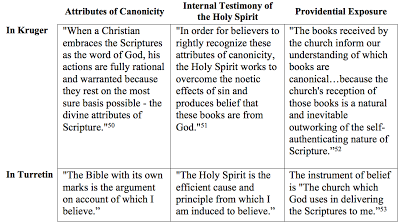 As Kruger said earlier, the self-determining model of canon utilizes a three-dimensional approach, taking into account Scripture itself, the church’s role in receiving the canon, and the Holy Spirit’s role in caring for the canon while ensuring that the Church trust and hold to it. All three dimensions of this approach are indispensable in Turretin, and just as in Kruger, none of the three features take higher priority over the others in his Institutes. While it is not being argued that Turretin and Kruger are identical in their views, and while they were writing in different contexts, for different audiences, and at somewhat different purposes, the similar trajectories between them are worth appreciating. Adam, as a result of seeing this book on your blog a few months ago, I asked for it for Christmas, and I have enjoyed reading it. I read a similar book a few years ago by F. F. Bruce, "The Canon of Scripture," but Kruger's book grabs my interest more than Bruce's book did. Kruger has an axe to grind (in a good way) and a point to make, whereas Bruce seemed content to blandly recite the details of various manuscripts and codices which led to the formation of the Canon. Both were profitable reads, but Kruger has the fire in the belly, which makes for a better book.